Two weeks ago I taught a week long Fashion History class at a local High School for 2 hours each day. I talked about education and career opportunities in related fields - Costume Design, Fashion Design, and Museum work. 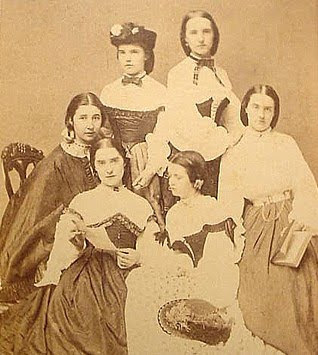 We also discussed fashion throughout the 18th and 19th centuries. I organized a field trip to Old Economy Village where we met up with my friend Sarah, who is the curator there. There the students learned about working with historical clothing and got to see some of the clothing in the work area that Sarah and her staff use to handle the textiles. The big project for this class of 8 High School students was to design and create a modern take on the 1860s Swiss Waist. We spent a large part of the class at the sewing machines. Some students knew a little about sewing while others had to learn a lot. And, I did a lot of catching up for them each night after class so that they'd all be on the same page with their projects the next day. But in the end they all went home with a Swiss Waist or Corset type garment that they can wear over their modern clothing. 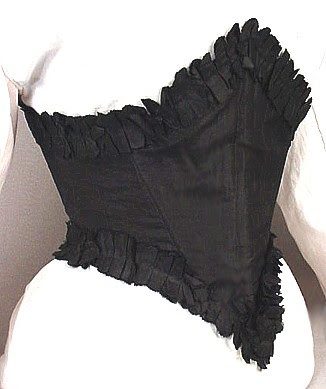 This is the 1860s Swiss Waist that our original pattern was based off of. Oh I am so glad to hear that you lectured to high school age kids. I love history and costume and I fear unless if we don't get out there and do what you did the next generation won't give a "rats a_ _" about either one. PS Somewhere in my inventory I think I have one. Now I'll have to go digging. Amazing blog!!! I make my own sidesaddle riding suits..
Lindsey, I'm making myself something (hopefully) similar to this for the fall. Any helpful suggestions of where to start? I always loved how it looked on you. Hi Sarah! When I made the pattern for this swiss waist I enlarged this (http://www.thegracefullady.com/civilwargowns/images/originalgarments/swisswaists/silk_waist3.jpg) image of the original swiss waist laying flat to my size (which was close to the original waist and bust), trued the lines, and added seam allowances at the sides and top and bottom. It has a layer of black silk taffeta and a layer of brown polished cotton flat lines together. Bones can be applied at each seam - I used the seam allowance from the seams rolled over and stitched by hand around the bones to create the bone casing. The top and bottom were finished with piping. I've seen the eyes of hook & eye sets used as the eyelets for swiss waists, or you could hand sew the eyelets if you have time. Of course, you could also start with a ballgown pattern that fits you and cut the top to the style lines that you like. The design lines on a ballgown are similar to many swiss waists.